Last night I once again debated Dr. Robert A. Martin, a vertebrate paleontologist who is professor emeritus at Murray State University. The previous debate was on the broad subject of creation versus evolution. This time, the organizers of the event wanted us to narrow our discussion, so we chose to talk about dinosaurs and people. Before I discuss the debate, I want to thank Dr. Martin for participating in it. I personally think the best way to understand an issue is to hear from multiple sides, so I think debates can be extremely helpful to those interested in controversial topics. However, it is difficult to get evolutionists to participate in debates about the creation/evolution controversy. I thank Dr. Martin for being committed to education strongly enough to be an exception to that general rule! Since Dr. Martin had the weaker position scientifically, I allowed him to choose whether to present his case first or second. He chose to go second, so I was up first. The initial activities (songs, introductions, and remarks from the organizers) made it clear that for some reason, the audience this year was overwhelmingly creationist. The previous year, creationists were in the majority, but there were many evolutionists present. That didn’t seem to be the case this year, so I started by thanking Dr. Martin for being willing to act as a lion in a den of Daniels. In making my case, I concentrated on the evidence that indicates dinosaur fossils are not millions of years old. I stressed the soft tissue that is being found in fossils that are supposed to be millions of years old (see here, here, here, here, and here, for example). I also discussed the fact that several dinosaur bones from different locations around the world all have enough carbon-14 in them to indicate that their maximum age is less than 40,000 years old. I also discussed how living organisms like the coelacanth, Wollemi pine, and tuatara falsify the geological-column thinking that leads most scientists to conclude that humans and dinosaurs didn’t live at the same time. I then moved on to human evolution, discussing the wealth of data that indicate humans did not evolve from an ape-like ancestor. I discussed how genetics and morphology (the study of the form and structure of organisms) disagree on our most recent common ancestor, how the similarity between chimpanzee and human DNA is far too low to allow for evolution, and how different data give completely different evolutionary histories when it comes to human evolution and evolution in general (see here and here). I also discussed the problems that exist with two of the main candidates for intermediate links between an apelike ancestor and people (see here and here). I also discussed the wide gap in fossils between the incredibly apelike fossils that supposedly represent our ancient ancestors and the incredibly humanlike fossils that supposedly represent early forms of people. 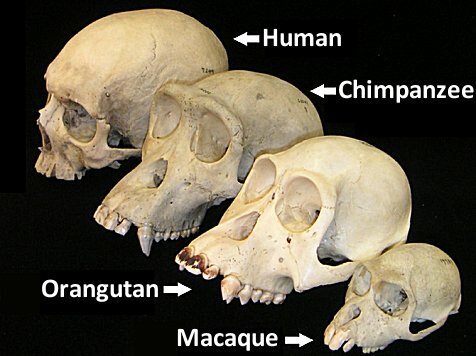 …it is curious that in a century-old race for superlative hominid fossils on a continent currently populated with African apes, we consistently unearth nearly complete hominid ancestors and have yet to recognize even a small fragment of a bona fide chimpanzee or gorilla ancestor. Dr. Martin’s presentation didn’t include a lot of evidence. It mostly included declarative statements like, “We know how old these rocks are. Their ages aren’t in dispute” and “Here’s what paleontologists currently think” (not direct quotes). He gave the generally-accepted view that dinosaurs went extinct (probably by a meteor impact) about 65 million years ago, and the first apelike direct ancestor of humans probably existed 6-7 million years ago. Thus, dinosaurs and people did not live at the same time. He showed several of the supposed evolutionary ancestors of humans, giving a picture of the skull associated with the ancestor and then what he admitted was a “fanciful reconstruction.” Unfortunately, he didn’t really discuss what features of the skulls make paleontologists think these creatures are related to people. Most of his presentation had the message, “Scientists have been working on this for a long time, you should trust us” (once again, not a direct quote). He did present evidence for one of the apelike ancestors (Australopithecus afarensis) having the ability to walk upright. It was the famous Laetoli footprints. He said that since they are dated at the same time as Australopithecus afarensis fossils, the footprints must be from them. Since the footprints look essentially like human footprints and show a human gait, they demonstrate that Australopithecus afarensis walked essentially like modern humans. He did make a couple of rather silly statements. In defending the traditional ages of rocks, he showed a picture of the Mars rover and said something like, “We can put a rover on Mars. Surely we can date a rock. How hard can it be?” He also showed a common meme that you find in many places. It was captioned, “Creationism: Because it’s a lot easier to read one book than a bunch of hard ones.” He also claimed that there was no scientific material in the Bible. In my rebuttal, I pointed out that we can put a rover on Mars, but we can’t cure the common cold. Dating rocks is, in fact, very hard. If it were easy, there wouldn’t be discordant dates or rocks on earth that date older than the supposed age of the planet itself. I told him that in my experience, creationists read a lot more books than evolutionists. The average creationist with whom I talk is much better informed on evolution than the average evolutionist is on creation. This is generally because informed creationists read both sides seriously, while most informed evolutionists read only one side seriously. I then listed some of the many examples of scientific content in the Bible. I also discussed the Laetoli footprints, including the quote in the link above that says if it weren’t for their date, they would be interpreted as human footprints, because they are essentially identical to the footprints a modern human would make. In addition, I pointed out that the only foot bone we have for Australopithecus afarensis is a single metatarsal, so we have no idea whether or not it could have made those footprints. In addition, there is a more complete foot fossil that is dated at the same time as Australopithecus afarensis, but since it couldn’t have made the Laetoli footprints, it is thought to belong to some creature different from Australopithecus afarensis. Thus, it seems the footprints are being forced to belong to Australopithecus afarensis, regardless of their appearance or what else is found from that supposed time period. In his rebuttal, Dr. Martin said that in listening to my presentation and rebuttal, it seemed to him that I had formed my opinion on origins and was forcing the data to fit that view. He said that soft tissue in dinosaur bones was not evidence they are young, but he couldn’t say what it is. He suggested perhaps contamination or some unknown process that could keep tissue soft for millions of years. He said that the carbon-14 in dinosaur bones was not from the dinosaurs. It must be contamination. He also said that while individual paleontologists might disagree about individual human ancestors (like the ones I brought up), the overwhelming number of fossils and their correlation in time show that humans evolved from an apelike ancestor. He also said that you wouldn’t always expect genetics to agree with morphology, because nature does strange things. There was a question/answer session afterwards, which had some good questions. It also had some really bad ones. In addition, despite being told to be succinct several times, many questioners seemed more inclined to preach than to ask a question. Most of the questions were hostile to Dr. Martin’s position. Only one was hostile to mine, and it was the question about how we see distant starlight on a young earth. I gave an answer based on general relativity. Dr. Martin said that it was a great answer, it just didn’t agree with what the vast majority of physicists think. I thought the best moment of the debate happened during the question/answer period. A questioner asked how reliable dating methods are. Dr. Martin said very reliable. He specifically said that carbon-14 dating is accurate to within 100 years or so. I chimed in with, “Well, unless it is dinosaur fossils being dated. Then, of course, it’s useless.” The audience applauded that, and Dr. Martin once again contended that the carbon-14 in dinosaur bones must be contamination. I discussed the several tests made to ensure that was not the case. I really wish the audience had been more balanced. I would have liked some tough questions, and I think the audience would have benefited from hearing them. Nevertheless, they did benefit from hearing Dr. Martin’s presentation, rebuttal, and answers, so overall, I thought it was another great debate. UPDATE: I ran across this account of the debate, which was written almost 3 months after it happened. This sounds very exciting. Will you update us when a video is available? JoeCoder and Dan, this is the organization that hosted the event and will be making the DVD. They have a DVD of last year’s debate, and they will be making one of this year’s debate. They don’t sell anything at their website, but if you contact them, I am sure they will arrange something with you. This must have been very interesting. Is there a video of this debate, and also one of your debate with Dr. Martin previously? Sounds like it was a great debate! In your experience, Dr. Wile, do most evolutionists make appeals to consensus, or other such assertions, when asked for evidence of an old earth or macroevolution? I’ve found that textbooks and documentaries from an evolutionary POV tend to simply state these things as incontrovertible facts without presenting real arguments. Caleb, the majority of evolutionists do use the consensus fallacy. However, there are a few evolutionists who have investigated the issue in detail and do concentrate on the evidence. I find that such evolutionists are few and far between. When it comes to textbooks, I can understand why they simply make statements of fact. After all, the textbook’s job is simply to teach the subject. It isn’t to persuade the student. I do agree that generally speaking Creationists know more about evolution than the Evolutionists do. Of course I have concluded that this is by choice weather it be conscious or not. Most people only gather enough information on a controversial subject in order to affirm their own world view. Yet trying to convince them of this outright will only succeed in alienating the very person you are trying to help. I have lots of experience with failed attempts to justify my faith. Even if I take Plato’s route and only ask questions, they most always become pointed or hostile which ends up being counter productive. I feel I have reached an impasse with the countless unsaved who use evolution as an excuse to discount God. Of course the hardest part is convincing myself that in their hearts they know God exists else they are fools and are beyond a logical argument. Ultimately I know that any topic that dictates how you live your life is controversial. This is why people avoid talking about politics or religion. Since if you are presented with a logical argument that conflicts with your lifestyle you are forced to make a choice. To either change your world view or defend it. Of course the most common approach to this problem is to simply ignore the facts presented and lie to yourself until it becomes your truth. Aaron, I agree that many have become fools and are beyond a logical argument. However, many are not. I started my journey from atheism to Christianity because of a debate I witnessed. The Lord uses many different means to bring people to Him. One of those means is evidence-based arguments. This is nothing to do with your post — hope that’s all right. My friend, who lives in Scotland, has asked me to pass on her good news to you. She has home educated all four of her children. She used your books, and the eldest boy went to school for the last year before university, which they will not do with the other children as it was more trouble than it was worth, from what she has told me! The eldest child has just started his degree in Engineering at Heriot-Watt University. She wanted to let you know that your materials really helped her. I have recommended your new writing for younger pupils, and she’s looking into it for the other children. Thanks, Anthea! I usually try to keep the comments related to the post, but there is no way I can’t approve this one! Tell your friend that I am thrilled my books helped her eldest at university! Great debate, Dr. Wile! Enjoyed reading; thanks for sharing. Always learn a lot here, especially when you’re debating someone. I had a question about bone fossil archaeology which may be OT, but thought you might be able to shed some light. Are the reports of supersized human skeletal remains uncovered across the globe credible, or a hoax? Here’s an example of a website on this topic. Thanks, Elizabeth! In answer to your question, I haven’t seen a single piece of convincing evidence for giant human skeletons. The problem with most of these stories is that they don’t provide references where you can go and check what’s being claimed. Also, we know that many of the pictures are fakes. In addition, there is a fundamental limit to the size a human can attain and still look human. If a person were 30 feet tall, for example, the blood pressure he would require to get blood to his brain when he is standing would kill him when he bent over. Very tall mammals, like giraffes, have an incredibly well-designed system to deal with this issue. Humans don’t have that system, because they don’t need it. There are many issues like that. In the end, if something human-like were on the order of 20-30 feet tall, it would not look very human, because it would need all sorts of non-human features in order to survive. The Bible discusses giants, but that term probably doesn’t refer to people who were 20-30 feet tall. It simply refers to people who were significantly taller than everyone else. In the end, that could be someone who is 9 feet tall. The tallest known man reached a height of 8 feet 11 inches. He was a giant. The Bible says that Og, the king of Bashan, had a bed that was about 14 feet long (Deuteronomy 3:11), which means he was probably between 12 and 13 feet tall. That’s a giant, but it’s not the kind of giant discussed in most of the claims involving giant human skeletons.